Facebook Groups are an ideal way for people who share the same interests to interact with each other regardless of whether they are friends or not in the social network. Although there are no finite rules and everything eventually boils down to personal preferences, Groups are probably more useful in comparison to Pages if the number of members is smaller. That said, the two features of Facebook frequently overlap, so it is down to the user to decide which he prefers. Groups are an earlier feature, after all; and Pages are fairly recent in comparison. This tutorial instructs users, particularly the new ones, on how to create a Group. Please note the date of this article as Facebook is always making tweaks to its systems and this post may not be relevant after a period of time. Refer to the left sidebar of the NewFeed or Home Page where you find Favorites, Ads, Pages and Friends Lists. Scroll down to the list of Groups. The sidebar view varies from user to user. If the Friends list is not visible, look for the More button. Drag your mouse and over the word Groups to bring out the clickable More hyperlink. Click on the word More to bring out all existing Group lists. Click the Create Group button to bring up the pop up window. 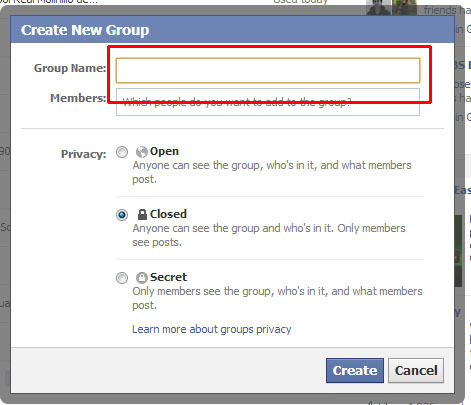 In the form box as shown in the graphic below, type in a name for your Group. In the Members form box as show below, begin typing the names of friends you wish to include in the Group. Facebook will conveniently show you friends with names of the same string of letters and you can choose from these. Add as many as you like. Decide whether your group is Public, Closed or Secret. Descriptions are given beside each type. Click on the appropriate box as shown below. Facebook by default selects Closed as an option. You can change the settings anytime after the group has been created. That’s about it! You have created your first Facebook Group. The ensuing procedure asks you to give the group a description and look at settings. Facebook will walk you through the process.